Q. I'm getting an error message when using Google Scholar. What's wrong? An error message is appearing in the reCAPTCHA box reading "ERROR for site owner: Invalid domain for this site key." An additional message is "Our systems have detected unusual traffic from your computer network. This page checks to see if it's really you sending the requests, and not a robot." That's followed by my IP address, the time, and a URL. How do I get Google Scholar to work? Seeing an error message like this? Unfortunately, occasionally Google blocks traffic from or through the library's proxy server. However, Google does not provide a way for libraries to contact them about Google Scholar when this or any other problems occur. 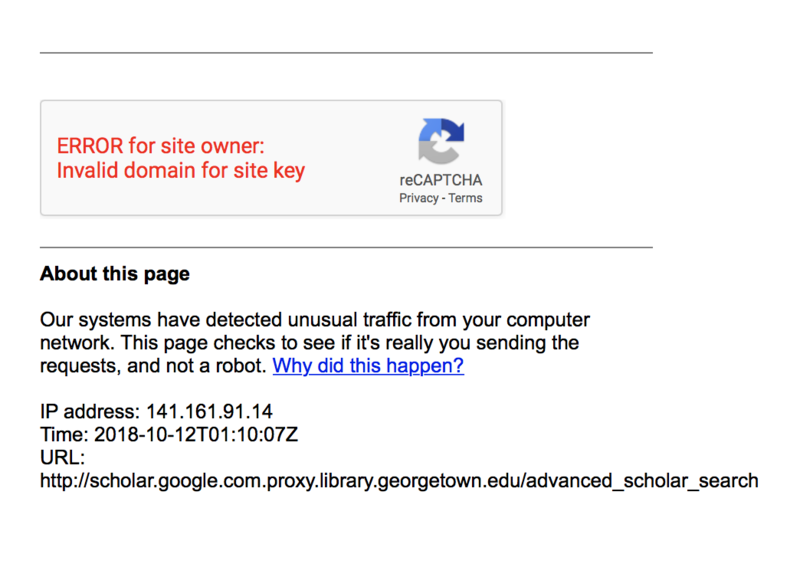 The block only becomes an issue when using the proxy to access Google Scholar from off-campus -- on-campus usage is generally unaffected. If past experience is any guide, the block will be lifted at some point. Without any information from Google, it is impossible to speculate when this block will be lifted. Make sure you're logged in (that your profile picture is displaying in the top right). 2. From the menu icon (top left), select "Settings" (then) "Library Links." 3. 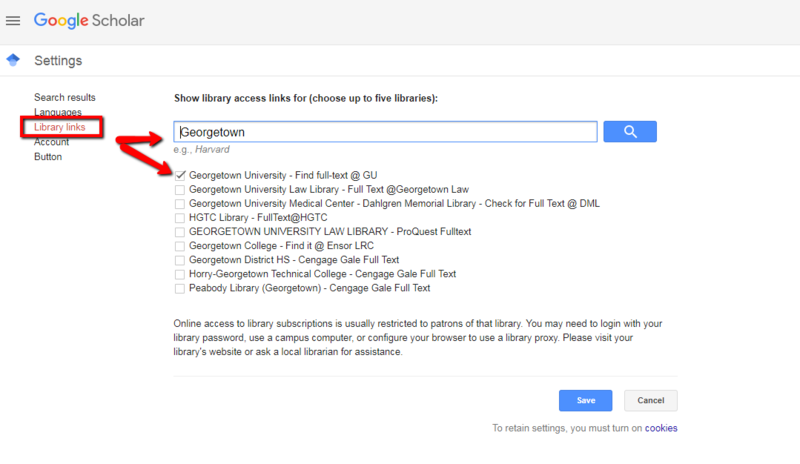 In the Library Links page, search for "Georgetown," and select "Georgetown University - Find Full Text @ GU."